about me over here but if you hit subscribe and listen to the first two episodes that will debut in May 2018, you will hear more about why I created this podcast and about the thru-hike of the Florida Trail I did with my husband in 2011. Subscriptions mean a lot to podcasts in helping the podcast be found by other listeners, so please hit subscribe in your podcatcher and later down the line, if you have enjoyed the episodes please leave a rating and review as well! 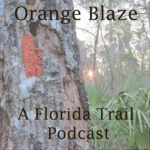 Enjoy listening and learning about the Florida Trail!